What is Domain Life Cycle? Domain Life Cycle increases your awareness and understanding on what happens to your Domain if you do not take immediate action to RENEW it. 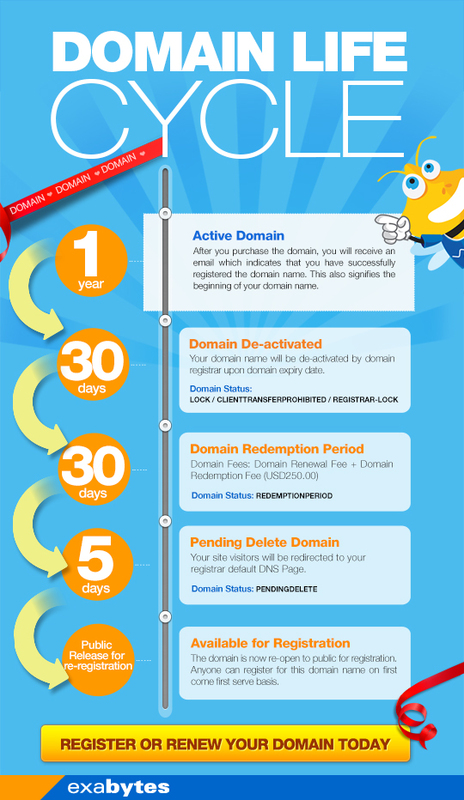 The infographic below tells you the domain lifecycle in a much clearer way. After you purchase a domain, you will receive an email informing you of your successful registration. This also signifies the beginning of your domain name. Your domain name will be de-activated by domain registrar upon domain expiry date. Your site visitors will be redirected to your registrar default DNS Page. The domain is now re-open to public for registration. Anyone can register this domain name on first-come, first-served basis. Take a look at the image below; the concept of domain life Cyle is rather similar to the Life Cycle of a Frog. The process starts from the first step, ends and repeats itself again. When Domain Redemption Period has lapsed, the process is IRREVERSIBLE. To prevent this from happening, RENEW EARLIER or Renew for Multiples Years.